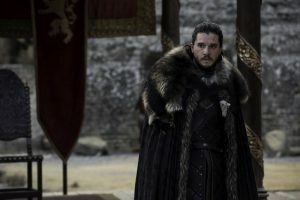 A shortened run means the latest season of Game of Thrones is already ready to come to a close this week with â€œThe Dragon and the Wolf.â€ This season has been all over the place in terms of quality, but â€œThe Dragon and the Wolf,” clocking in at nearly 80 minutes, is certainly going to try to close things off on a high note. For one, the longer length may be an attempt to make up for the the amount of story that showrunners David Benioff and D.B. Weiss have tried to cram into seven episodes. And although last season also had some issues with consistency, the finale â€œThe Winds of Winterâ€ brought things together in an impressive mannerâ€”maybe â€œThe Dragon and the Wolfâ€ can do the same. In this episode, we at the turning point of all of our major players coming together in Kingâ€™s Landing. We know Jon Snow (looking so out of place in the South) will be meeting Cersei, the Unsullied and the Dothraki alongside him, all in an effort to convince Cersei of the threat of the White Walker and, presumably, get her to help. 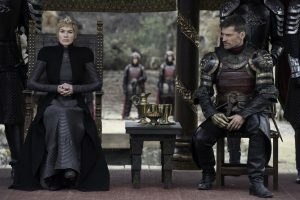 Or at least to stop getting in the way of Jon trying to fight â€œthe only war that matters.â€ The last episode, â€œBeyond the Wall,â€ solidified the bond (politically and otherwise) between Daenerys and Jon, and consequently, their united front will probably be an important aspect of the meeting with Cersei (though Daenerys is noticeably missing from the trailer). 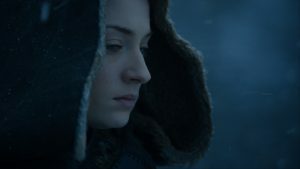 Finally, the trailer for â€œThe Dragon and the Wolfâ€ featured some shots of Sansa looking especially uneasy, looking over Winterfell with the snow coming down around her. With the tense conversation she had with Arya last episode, this isnâ€™t a surprise. But Winterfell has felt further and further away from the main drama this season, so whatâ€™s really happening here with the Starks? Sansa and Arya clearly have something brewing that Littlefinger cooked up. But the one wildcard is Bran. And maybe he will be making his significance known sooner rather than later. The Game of Thrones season 7 finale airs Sunday at 9/8c on HBO.